A special person went missing today at the wedding ceremony of Peter Okoye and the person is Jude Okoye, the big brother of the bridegroom. Apparently, Jude Okoye couldn’t make it to the wedding today due to a recording schedule. Sources claim he was with Wizkid at Mavin Studio throughout today recording a new music. Fans have not stopped blasting him on the social network today for displaying affection for money more than his blood brother. Before we start blaming Jude, we must keep in mind that Peter Okoye himself was out of town yesterday. He missed his Bachelor party due to a commitment in Ghana. 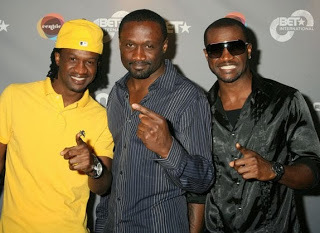 Peter Okoye arrived Lagos Nigeria in the early hours of Sunday for his wedding. Can you imagine the kind of stress he must have put his wife,Lola Omotayo through. Note: Paul Okoye was actually at the wedding, he just laid low. Though guests claim he was missing in action but I saw him myself at the wedding on TV few hours ago.